Getting young children to be excited about mathematics can sometimes be a daunting task, but help is available. The “1st & 2nd Grade File Folder Math Games” book makes learning mathematical concepts not only easy but fun! This book provides a variety of ways to engage young learners in an in-depth manner that helps them to grasp mathematical concepts much more easily and thoroughly. Achieving math proficiency requires repetitive practice, which can quickly become a big turn-off for the young child, but they love to play games. Creativity and variety are a must to capture the short attention span and focus of children in this age group. The “1st & 2nd Grade File Folder Math Games” book contains 93 different printable math games that are designed to be naturally appealing to the playfulness of young children. You can employ “1st & 2nd Grade File Folder Math Games” printable math games in a variety of ways in the classroom environment that encourages student participation and is conducive to developing autonomy and mastery of the “Common Core Math Standards”. They can be used to engage the entire class, small groups, or purpose specific work centers. Whatever your preference for disseminating this material, it’s a “win-win” scenario. It will generate greater student participation, and focus which results in increased learning productivity. It Makes Learning At Home Fun! Assigning the math game printable work sheets as homework can be the catalyst that helps to engage parents and siblings in the learning process at home. This virtually extends the learning environment beyond the limitations of the classroom. It will provide an ideal opportunity for students to obtain a greater understanding of mathematical concepts, in addition to even more practicing of skills learned. It Strengthens Foundational Math Concepts! Mathematical concepts are designed like building blocks. Each skill learned and mastered provides the foundation for math concepts of greater complexity. It is of the utmost importance that students develop automatic recall of basic math facts, rules, and functions in order to excel in math. “1st & 2nd Grade File Folder Math Games” can help to strengthen that foundation of learning. Teachers have a limited amount of time to teach each subject matter during the school day. The “1st & 2nd Grade File Folder Math Games” book saves the time and effort to create and develop lesson plans that include activities that are interesting, engaging, easy, and fun. Games are a great way to incorporate repetition and practice that what would otherwise be vey tedious and boring. It Enhances and Supplements Classroom Teaching! “1st & 2nd Grade File Folder Math Games” book provides a “no worries” way to complement classroom teaching. It’s quick and easy to incorporate in the classroom. Makes learning fun for students, teachers, and parents alike. The activities are aligned with the current “Common Core Math Standards”. It is another tool you can add to your teaching arsenal that lends itself to an improved in-depth learning experience for everyone! The goal of every teacher is to create autonomous learners. In order to achieve that goal, students need to develop self-confidence in their ability to learn any subject matter. What better way than doing the activities contained in the “1st & 2nd Grade File Folder Math Games”. The more they play these games, the more they learn. The more they learn, the better they get at applying the knowledge they have gained. The better they get at utilizing their math skills the more confident they become as they achieve mastery of mathematics. You can empower and inspire students to achieve greater learning, by simply incorporating “1st & 2nd Grade File Folder Math Games” into your teaching environment. Included in this bundle is 14 Addition & Subtraction anchor chart to put on your Math Vocabulary board to use as a reference. Addition facts are important for students to memorize, but practicing these can be a bore; these worksheets/mazes add a fun factor to practicing Addition facts so that students will actually look forward to completing their math work. These addition worksheets build in difficulty so that you can easily differentiate for your different learners while maintaining rigorous instruction for all of your students. 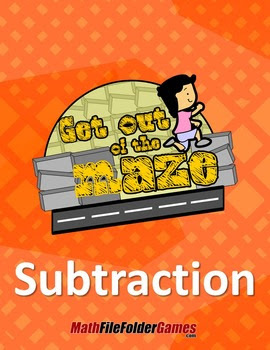 These Subtraction worksheets/mazes gives the students a fun and differentiated activity while allowing for quick and painless grading! This is a great activity for students to complete as a practice or homework. 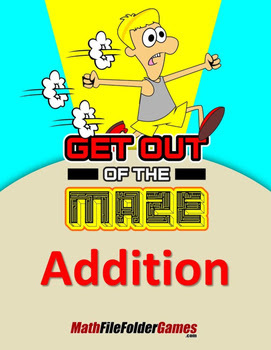 It will help them practice their Subtraction facts, but also have fun going through the maze! Although these mazes can be used in a variety of ways (such as classwork, homework, or morning work), they make excellent math centers that are a snap to create; just laminate and use dry erase markers. Your students will be highly engaged in a challenging math activity with very little work on your part.